MASSACHUSETTS – It's not every morning you find a drunk man asleep in his running car at 3 am. For one Redditor, however, this was exactly what he walked into. The Massachusetts man was on his way home from a bar when he noticed the man, removed the keys and hid them in the backseat. 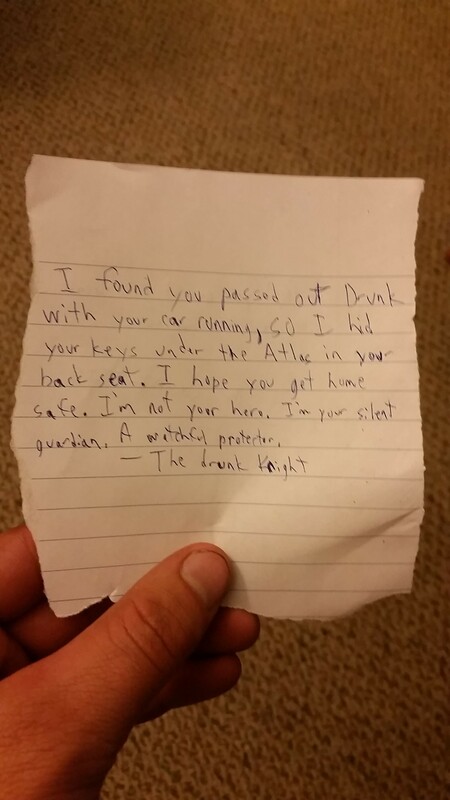 He then left a note saying "I found you passed out drunk with your car running, so I hid your keys under the Atlas in your back seat. I hope you get home safe. I'm not your hero. I'm your silent guardian. A watchful protector. – The Drunk Knight." The self-titled "Drunk Knight" snapped a picture of the man and even left a bottle of water waiting on the steering wheel. Now I'm sure the man's hangover will be pretty rough when he wakes up, but at least the Drunk Knight was there to prevent any serious damage. He posted the pictures of the incident to the "Funny" section of Reddit. The post has received thousands of votes and hundreds comments.